It is my hope that the Leadership Conference of Women Relgious refuses to participate in their own oppression. How can anyone submit to a report that reflects an abuse of power that is not transparent and accountable to the people of God? Mother Clare's report goes directly to the Vatican. Neither the sisters, nor their leaders even sees it. Sounds like a return to the Inquisition to me, Sisters. We need your prophetic voices to speak truth to power as you have so often done in your past history. Enjoy this youtube video of Pope Benedict and hierarchy in the Vatican. Be prepared, womenpriests make two cameo appearances!!! Looks like Roman Catholic Womenpriests have cracked the clerical glass ceiling in the imagination of Catholics who seek renewal in our beloved faith community! "While LCWR itself beats a moderate path and tries to stay out of trouble with the Vatican, the sisters who are members believe they can ask questions. Like why can't I be a priest? Shouldn't LGBT folks have civil rights and be able to get married? What would Jesus want of us in these areas of life?" This is a live stream of the 9:00am Awesome Grace service from Lamb of God Church in Estero FL. 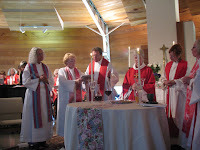 Roman Catholic Womanpriest: Judy Lee was the guest homilist. LOUISVILLE, Ky. -- When he was a 25-year-old novice in a Roman Catholic religious order, Lawman Chibundi was assigned to work in the remote Kalahari Desert in Botswana, Africa, where his novice master advised: "Before you get there, remember - God is already there." A decade later, Chibundi says he has been repeating that message to himself as he undergoes another, very different journey. "Roy participated in my ordination Mass. He celebrated the Eucharist with me, the other women priests and the woman bishop who ordained me. He laid hands on me in blessing after I was ordained.